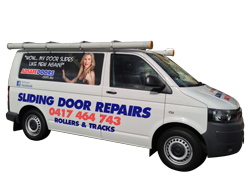 Need Your Door Closers Installed Or Repaired? Call Us Today For A Free Door Closer Quote. Hydraulic door closers have a similar design in that they all have a spring which causes the door to close and they all have a piston with a hydraulic seal which moves along the cylinder. At the top of the cylinder is located a valve which can be opened and closed. This valve allows the hydraulic fluid to escape into the hydraulic reservoir as the spring pushes the piston along the cylinder. If the valve is closed off the hydraulic fluid is pushed slowly into the reservoir, and so the door closes slowly. As the valve is opened the fluid is pushed into the reservoir faster and more easily, and so the door closes quickly. By adjusting these valves on the door closer, we can adjust the rate at which the door closes to our satisfaction. However, in practice, most door closers have two or more valve adjustments. One valve is so that the closing speed of the door can be adjusted while the other valve adjustment is so that the latching speed can be adjusted. The closing speed of the door closer is generally between 100 degrees and 20 degrees while the latching speed is between 20 degrees and 0 degrees. In addition to these valve adjustments, door closers have other similar operational adjustments which are often mistaken for valve adjustments and when used by inexperienced technicians often result in dire consequences for your door. In short, it is always better to use a trained technician when adjusting a door closer. There are different types of door closers. Some door closers are visible on the door or the door frame, and some are not easily seen since they are located on the floor or the door frame. 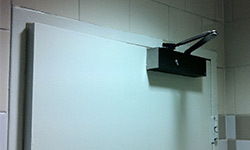 As to those that are visible on the door or frame they are referred to as, Surface Mounted Door Closers. While those which are not visible and are located in the door frame above the door are referred to as Transom Door Closers. Those which are located on the floor are referred to as, Floor Springs. Surface mounted door closers, if installed on the inside of an inward opening door, have their arms projecting out at right angles to the face of the door. Surface mounted ones installed on the inside of an outward opening door have their arms running parallel to the face of the door. This difference in installation is very important for the correct operation of the door closer. Also, the door closer must be positioned at the stipulated height relative to the door frame, and it must be within the specified distance from the door jamb. The positioning of the door closer on the door compared to the door jamb is determined by the manufacturer such that the door closer is most efficient in operation and delivers maximum life. Note that with hidden door closers there are no hinges on the door and door jamb. In the case of a floor spring, we have a pivot at the top of the door going into the transom door jamb, while with a Transom Door Closer we have a pivot bearing on the floor. You can identify a transom closer quite quickly by looking at the top inside of the door. Look for a little plate about 40mm x 15mm, which held onto the door with two small screws. Usually a Philips head, or if the plate is absent, you will see two or three Alan screws. If the small plate is present for this door closer, it may display a brand name. The floor spring door closer can be identified by another plate, which is found on the step underneath the door. And the size of that plate can vary, from being 75-100mm wide and 200-300 mm long, and it is usually shiny stainless steel possibly with a brand name of the door closer showing. This metal plate is screwed to the floor spring with about four countersunk screws. Different brands and different models of door closers deliver very different performance. Also, some door closers have stay open features. It is always best to choose the door closer which is best suited for the job at hand because, the installation of the incorrect one nearly always, results in a waste of time and money.